Even though we know the drill, we never remember to budget for that pesky 12.5% percent service charge and then there’s the dreaded bill splitting conundrum (I love you Becky but that doesn’t mean that I want to pay for your extra mojitos and calamari rings). So, to help you to eat out more often, here are ten tips and tricks for saving money on eating out. Think you can’t afford a top notch meal? Think again! 1. Dig up a deal. My first move when I’m dining out on a budget is to search for restaurants which currently have deals floating around. My favourite place to start is Bookatable because it features some really nice restaurants. You can find deals for places like the Ritz on there – even upscale restaurants have low seasons where they struggle to fill tables. I also like to scour the LivingSocial and Wowcher sites as they often have great deals like £39 for 3 courses and unlimited prosecco in a glamorous 4 star restaurant. 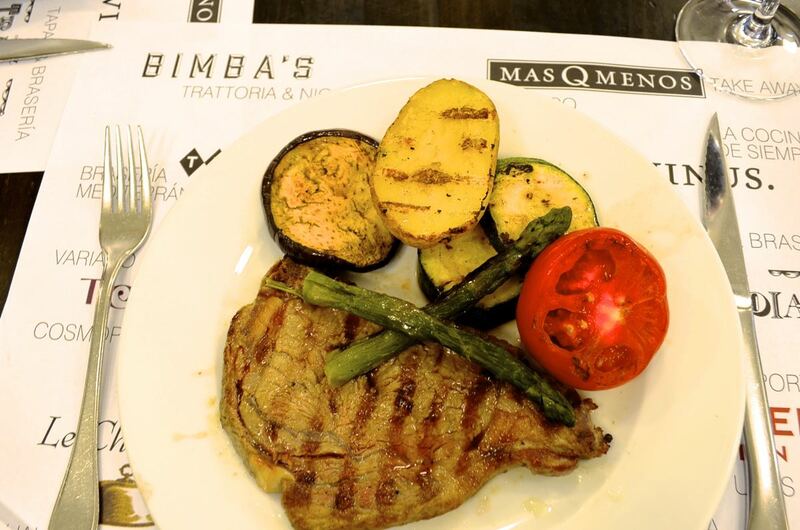 There are deals to be found for every meal from breakfast to late night supper. It’s definitely worth a look. 2. Get to the points. Supermarket points cards are another great way to save money on meals. Nowadays the points cards that supermarkets offer not only get you money off your grocery shop but also restaurants, cinemas, shopping sprees and plenty of other forms of entertainment. It’s worth the two minutes filling in the sign up form so that you can start collecting money on things you were going to buy anyway. My current favourite is Tesco Clubcard as, with their Clubcard Boost scheme, each voucher can be worth up to 4 times as much with the partner brands. Whenever I need groceries now I’ll always try to go to Tesco so I can use my card to rack up points. Even if it means passing another supermarket and walking a bit further, it’s worth it for the money I’ll get back in the end (plus the extra cardio never hurts!). Signing up to points cards doesn’t mean being hounded with marketing emails either. Once you sign up you can always change your preferences so that you’re contacted minimally. 3. Join the club. As well as points cards there are plenty of other club cards you can get to start saving. Tastecard is a a great one worth investing in. £39.99 a year may sound a bit steep at first, ‘hey Jade, I’m trying to save money here and that’s a whole meal in itself!’, I know but just hear me out. Tastecard offers great saving like 2 for 1 on food and 50% off your total food bill at loads of popular nationwide restuarants. This means that you only need to eat out twice before the card has paid for itself, then you get to enjoy the discounts for the the whole year. Still not convinced? 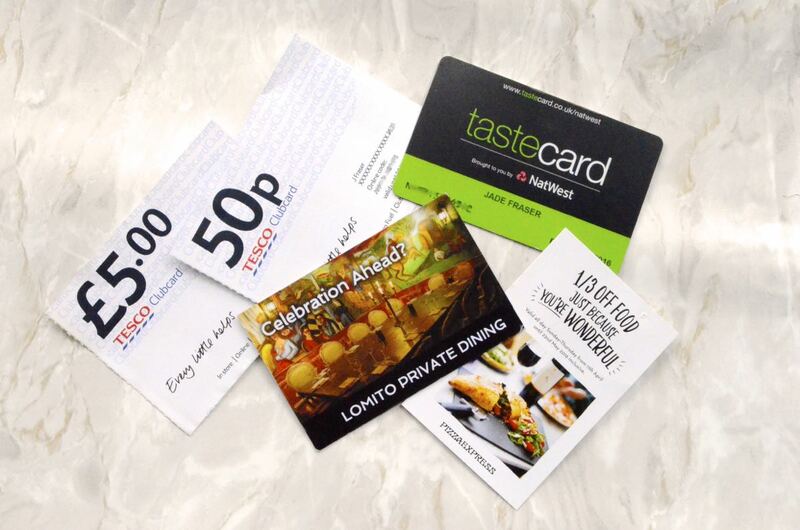 Tastecard currently have an offer where you can get the card for just £1 for the first three months’ membership. Order one, try it and if you don’t like it (trust me you will) just cancel your membership before the three months is up. There are quite a few discount clubs like this and many of them are offered as perks with your bank account, mobile phone bill or even with your job so it’s worth asking around to find out what you could be missing out on. 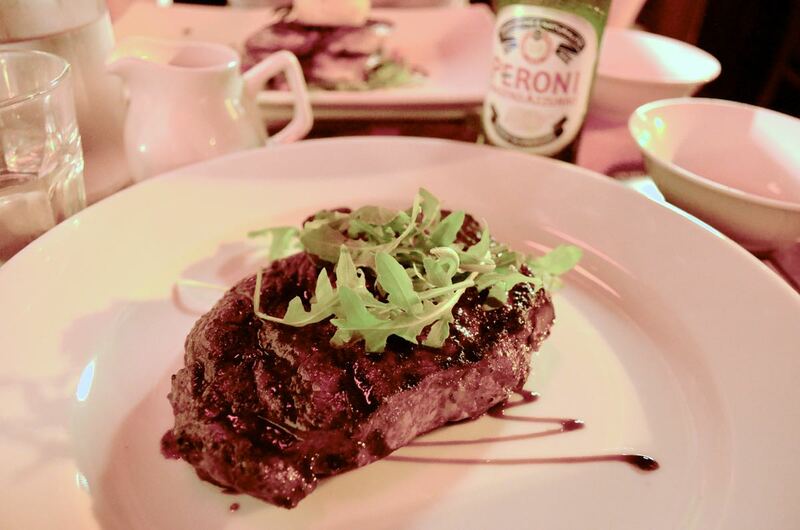 Want steak but can’t stretch to the £25 price tag? Why not split it with bae, halving the cost then order an extra side instead? 4. Get social. When it comes to finding a great restaurant you can’t beat word of mouth recommendations so I often take to Twitter to find out where’s actually good. If I ever see someone tweet a great food pic I’ll follow that restaurant and add them to my ‘Great Restaurants’ list, ready for when I next want to eat out. It’s a great way to keep up to date with your favourite restaurants’ current deals as they’re bound to take to social media to spread the word like Hakkasaan’s Dim Sum Sunday – a personal favourite of mine. I also make a point of following food bloggers who are great source of helpful, honest reviews and tweeting about great deals (I always tweet about a deal I like!). If I’m still coming up short I’ll tweet myself asking for recommendations for my area, preferred cuisine and price range and I can guarantee that some helpful people will come to my rescue. 5. Ask and you shall receive. As well as checking social media, be sure to check restaurants’ own sites for deals. They’ll often list all of their offers and there is sometimes extra money to be saved by signing up to their email list. Again, you can sign up, download your voucher and then simply unsubscribe once you’ve used it if you really wish. I prefer to just drag promo emails to a ‘restaurants’ folder in my email ready to scour when I’m next eating out! It doesn’t hurt to double check when you’re booking either. I’ve had a few places ask ‘are you using any deals or set menus?’ when I’ve called up to book. There’s no harm in playing dumb and saying ‘yes, someone told me about a great one here but I forgot and wanted to ask what you offer’. As they say, if you don’t ask – you don’t get! 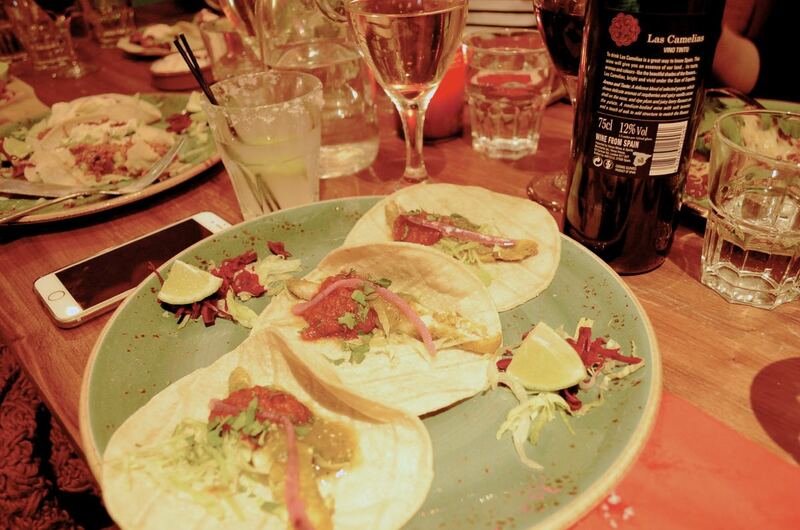 Happy Hour is a great time to eat out – two for one drinks will cut a lot off your total bill. 6. Spend smart. All the vouchers and coupon codes in the world can’t help you if you let your stomach get the best of you and order the world once you arrive. If you’re on a strict budget take cash and leave your card at home so that you’re not tempted to order extra entrees and drinks that you can’t afford. Let’s be honest, most of us eat out for the social experience rather than because we don’t have food at home so if you’re really low on funds but don’t want to miss out, don’t be ashamed to eat an early dinner at home and just nibble on a side or share dishes. Rather than thinking it’s ‘tacky’, real friends will appreciate the fact that you’ve still made the effort to join them even though you’re stretched. You could always make the excuse that you overate before and just aren’t that hungry – hey it’s true! A lot of restaurants also offer ‘light’ dishes that are smaller with fewer calories so both your waistline and your wallet with thank you. 7. Only pay your share. One of the worst conundrums when eating out with friends can be the dreaded bill split. Yes, we’d all love to live like Rockafella and just throw our card onto the table declaring, ‘everything’s on me!’ but sadly a lot of us just aren’t there yet. Worst of all are the dreaded words, ‘shall we just split it equally?’ usually uttered by the one person who’s ordered three courses, one of them being lobster linguine and then guzzled the ‘shared’ wine bottle like they’re dying of dehydration. Funny that… No one wants to be the Scrooge who points out that they’ve had less than others but if you’ve made a point of eating less to save money it’s just not fair that you should have to pay more than your share. Even once this has been acknowledged there’s the frantic 20 minute game of ‘pass the bill’ as you all try to work out how to split three bottles of wine between four people, when the fourth only drank from the first two bottles. Fml. Luckily for us, apps like Billr make bill splitting app soooo much easier. You can enter each person’s name, add items under them and let Billr to the maths for you. You can even text or email a copy to each person for peace of mind. It’s well worth the 79p download price to save a friendship or two. 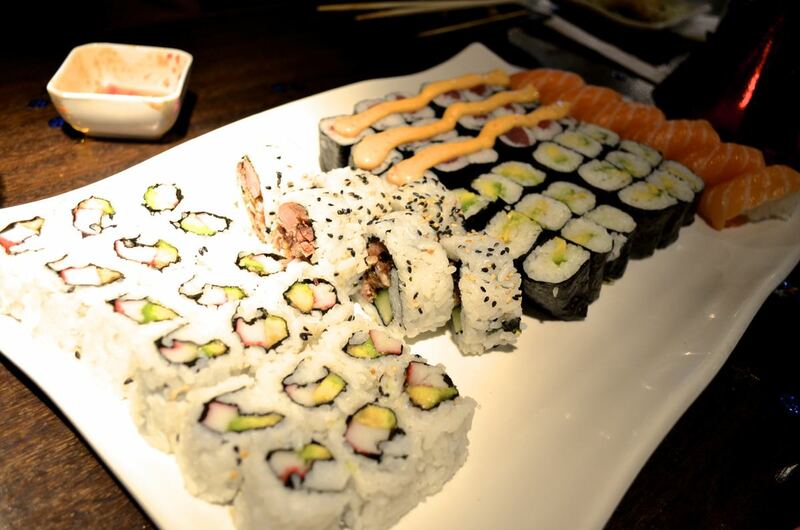 The unlimited sushi platter at Sushi Salsa in Camden – delicious, generous and highly affordable! 8. At your service. So this is a little controversial but as we’re on the subject it’s worth pointing out that the 12.5% service charge that is automatically added to most bills nowadays is usually optional for tables under six people. The word ‘discretionary’ means with the freedom to choose what to do. Translation: you don’t have to pay it and can ask the restaurant to take it off if you wish. A lot of us will pay this service charge thinking it’s compulsory and then add a tip on top of this. 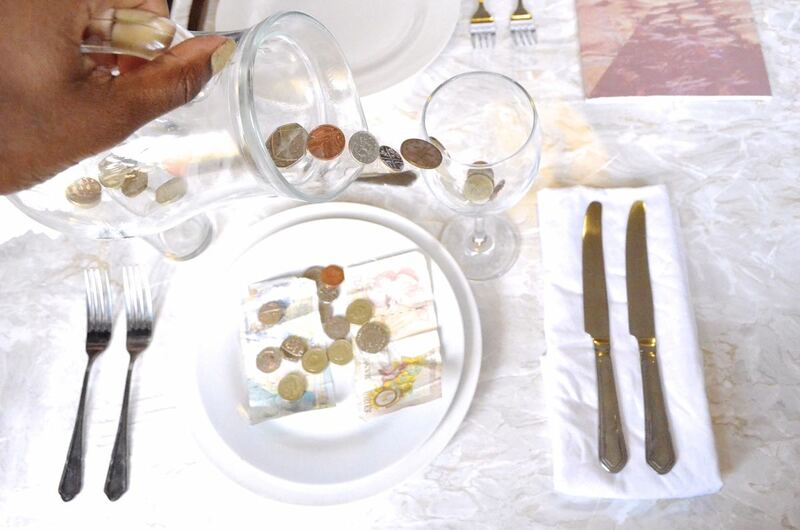 Whilst some restaurants claim to give the service charge to their staff, many actually pocket it giving the excuse that it allows them to pay their staff a higher hourly wage – not always the case. An idea is to to ask that the service charge be removed and then pay the amount as a cash tip where it has a better chance of going to the servers although, again, this isn’t always a guarantee. To be honest I just pay both and budget for the expense because I don’t like to think of staff being mistreated but if I was earning a low wage myself and had saved up for a treat meal or had received particularly bad service, I wouldn’t feel obliged to pay anything other than the exact price set out for my meal. It’s your money, spend it how you wish. 9. Stay loyal. Once you find a restaurants that you like it’s worth showing your loyalty to them in exchange for some reciprocal love in the form of a discount or too. Often the table receipt will come with a feedback form that you can fill for the chance to save money on your next bill. A lot of restaurants hand out ‘come back again’ vouchers for money off your next visit so don’t throw these away but pop them in your purse for next time. Once you know you like a restaurant, staying on their mailing list is often worth it as you’ll get first dibs on special offers and perks like birthday discounts offering you a free meal or bottle to celebrate – yay! I usually get quite a few of these on my birthday so, rather than waste them, I’ll just offer to forward the voucher to family and friends. Encourage them to sign up to their favourite restaurants too and then any time you want to eat out ask around to see who has a voucher they’re not going to use. You’ll also get first dibs on things like taster menus which is when a restaurant wants to try out new recipes so they offer loyal customers a set menu deal for a discount price. 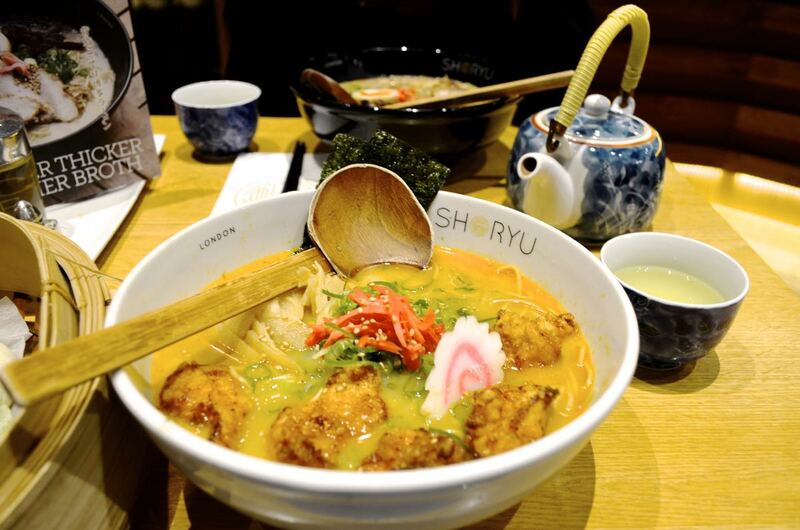 Shoryu Covent Garden are offering 50% off all ramen 22-28th June to celebrate their opening – yay! 10. Think outside the box. Sometimes fine dining just isn’t an option and that’s more than okay! This doesn’t mean that you can’t eat out, you just have to change your tactic. There are so many great bars and eateries around that do affordable dishes for less. I love to look on Tripadvisor for recommendations of cheap eats as it’s like having a cool best friend who knows about all the hidden gems in your area. Think outside the box and perhaps hit up a food market or an exotic hole in wall. If you go by recommendations you’ll still get delicious food that’s cooked by a chef and you can take the opportunity to stroll, catch up with a friend and take in your surroundings as you eat. 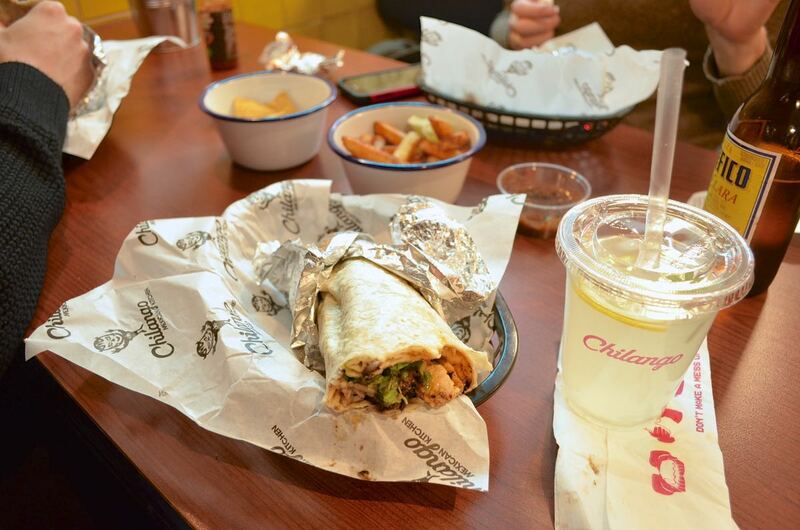 Chilango in Camden is a great place to sit and grab a casual, affordable bite. I hope that this has given you some food for thought on ways that you can afford to get a little fancy and eat out more often! If you know of any more great tips, clubs, apps or deals let us know in the comments below! Thank you for reading! If you like my posts why not follow me on Bloglovin’ and social media by using the links below!